Are you looking for an air conditioning company in Sarasota and Manatee Counties you can trust for ac installation? Call Home-Tech today! Since 1981 we have improved homeowners’ indoor air quality and energy costs. Do you have hot or cold spots in your Florida home? We can help with that. Our Comfort Specialists will guide you on the selection of energy-efficient and properly-sized air conditioning systems, programmable thermostats, air cleaners, humidifiers and two stage technologies. View a video below to learn more! We answer 3 important questions. 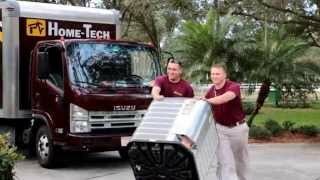 Home-Tech does a superior job in SW Florida installing AC systems. Here are 18 distinctions that set us apart. 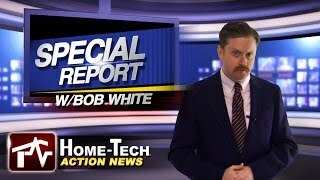 Home-Tech news reporter, Bob White blows us away with the ins and outs of an air conditioning Clean and Check by Home-Tech. We sell high-quality air conditioning systems from Carrier and Trane. Home-Tech’s professionals are NATE-certified, licensed and background checked. We proudly serve Sarasota, Bradenton, Lakewood Ranch, Anna Maria, Longboat Key, Siesta Key and surrounding areas. Give us a call today! 1. Home-Tech is a trusted, award winning employee owned company. 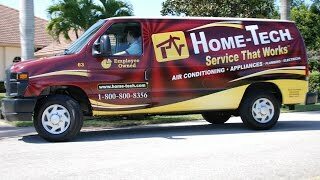 Since 1981 we’ve been providing AC installation in SW Florida. We are proud of the culture of superior customer service that we have built. We are A+ rated with the Better Business Bureau and are involved in giving back to our communities. 2. Our knowledgeable, trained and NATE certified Technical Representatives are trained to inform, assist and give the homeowner the tools they need to make an informed decision based on much more than price on their ac installation. 3. Our trained, uniformed and NATE certified installers understand the systems, equipment and operation of today’s sophisticated cooling and heating products. 4. Home-Tech complies with all local municipal rules, codes and permitting including building permits, notice of commencement, smoke & fire permits and proof of insurance. These requirements are put in force to protect you, the consumer and homeowner. 5. We verify that all ac installation system equipment is properly matched as designed and qualifies for all available utility rebates and federal tax credits. 6. Our Lead Installer arrives early on the day of the ac installation to inspect and verify that all necessary ac installation equipment and materials are on the job site. 7. The recovery of the old system’s refrigerant is done by our EPA-certified installers and technicians. 8. In many cases the Lead Installer finds the original air handler location needs to be modified because it is in an area that is not optimal to operation. When space and access allows, our skilled ac installation crew will make the necessary changes to ensure peak performance. 9. Minor duct changes and connections are included in our standard system pricing. This often overlooked aspect of the indoor comfort system may need additional modifications or complete replacement to be compatible with today’s high-efficiency equipment. 10. Home-Tech will make necessary changes as per manufacturers’ recommendations to the copper lines connecting the air handler (inside unit) and condenser (outside unit). 11. New supply and return plenums (boxes on each end of the air handler) are fabricated and installed on-site for proper adaptation to the existing duct system. 12. An in-line filter drier, which keeps the system’s refrigerant (cooling fluid) clean and free of contaminants is always included in a Home-Tech ac installation. 13. All Home-Tech ac installations include proper “tie-downs” or hurricane straps rated at 150 mph. 14. Depending on the complexity of the ac installation a field supervisor will be on site and assist in the installation and/or start up. 15. During start-up, a static pressure test is performed and recorded. This test confirms proper airflow through both air handler and duct system. The recorded information is very helpful for future troubleshooting. 16. Every homeowner appreciates a well-balanced, evenly-distributed cooling and heating system – eliminating warm and cold rooms. The “Flow Hood” takes all of the guesswork out of a balanced system. 17. Usually the following day or when it’s convenient to the homeowner the Technical Representative will give the orientation and answer any questions regarding their new high-efficiency indoor comfort system. 18. After a couple of weeks, giving you time to settle in with your new system, your Home-Tech Technical Representative will contact you by phone or email to see if there are any other questions, concerns or information regarding your new system. Your absolute satisfaction and continued support is what ensures Home-Tech’s success. Jason and Adam installed our new upstairs A/C today. They worked hard, were very pleasant to work with and went out of their way to let us know what was going on during the process. Outstanding service! James Goodwin inspected my AC system and cleaned it thoroughly. Anything great job by Home-Tech! Keep up the good work! 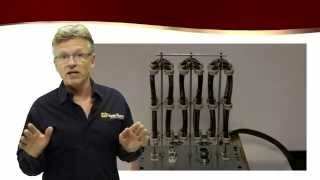 Indoor Comfort System – What is it?